We know that many people take coloring seriously, using it as a way to escape the stress of daily life. Specifically designed for more experienced colorists, this exciting new series presents highly detailed illustrations based on today's most popular and sophisticated themes, from mandalas and mosaics to flowers and animals! 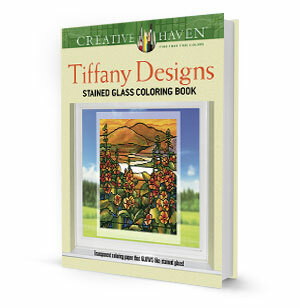 Sixteen gorgeous motifs, all based on actual Tiffany windows, offer colorists a gallery of scenes inspired by nature. Designs include birds in a blossoming tree, trumpet vines on a trellis, and a mountain landscape.